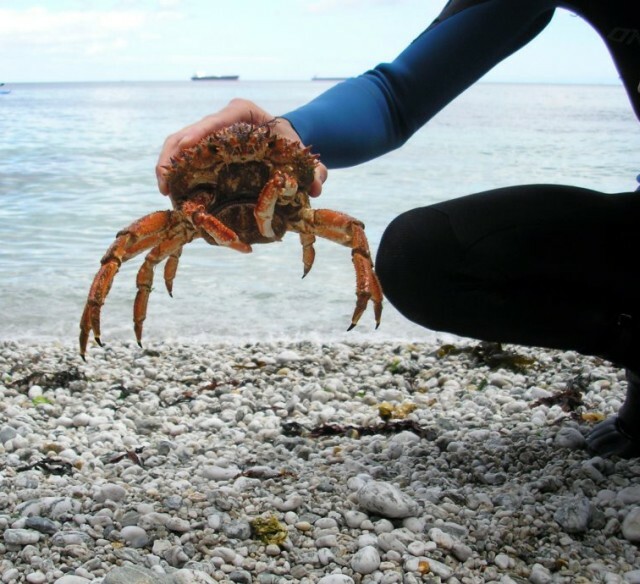 Spider Crabs start to turn up on our shores around late Spring time and by Mid Summer the larger males have turned up to join the party and the picking can be ripe. They are very easy to spot as they’re fairly sizable and are always a bright orange/red colour. They like to stay out in the open waiting for there dinner to float past. However they also like to hang out under the kelp too, so its worth pushing this aside and having a look. Your target is the male Spider Crabs which have much bigger claws (the ladies aren’t worth taking as they have hardly even a morsel of meat on them). The other main difference is the chicks have big egg pouches too. My technique to pick one up works well and the vast majority of the time your fingers will remain unscathed. Flip them up so their legs are pointing up and their back painting down. (This puts them in defence mode and they will normally curl their legs up. Like every animal you are planning on eating, you need to make sure you do this humanely and ONLY if you are going to eat it. We’re hunter gatherers not psychopaths. You need a good strong knife (I use the Cressi Killer). Flip them onto there back so you can see the triangular flap underneath. Carefully pull this to the side until you can see the small hole. Now take your knife and insert hard here. Once in you should push in the direction of their eyes. Your Spider Crab should have now snuffed it. Enjoy.